Charge into action like a First Order Stormtrooper! Blaster fires glow-in-the-dark darts and features laser blast sound effects! Motorized action unleashes 12 darts in a row with clip-fed blasting. Includes a 12-dart clip and 12 Elite GlowStrike foam darts. Equipped with sleek armor and powerful weapons, the Stormtroopers enforce the will of the First Order. 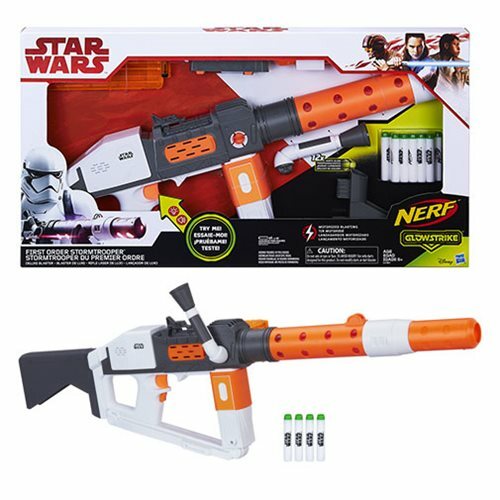 Now, kids can imagine charging into the action like a First Order Stormtrooper with this motorized Star Wars: The Last Jedi First Order Stormtrooper Blaster that fires glow-in-the-dark darts and features laser blast sound effects! GlowStrike technology charges the darts to make them glow when fired, while the blaster's acceleration button powers up the motor for motorized action and unleashes 12 darts in a row with clip-fed blasting. Illuminate your Star Wars battles with the Star Wars: The Last Jedi First Order Stormtrooper Blaster! Includes blaster, stock, barrel tip, clip attachment piece, eyepiece, 12-dart clip, 12 Elite GlowStrike foam darts, demo batteries, and instructions. Some assembly required. No tools needed. Ages 6 and up.